Most of the sites have carefully avoided mention of Bridgestone's "green tires" to be used during the Japanese GP in Fuji. I can understand why such an item should be lost when there are momentous things like the loss of the Canadian GP happening but, I'm sorry, I just cannot resist it. There is something so delightfully apt in the idea that I have to poke a little fun at it. Of course, the tires will not be completely green; as the photo shows, just the grooves will proudly proclaim the sport's commitment to environmentalism. In fact, there is nothing green about the tires apart from the fact that they will carry a little green paint. This is F1, after all, and what matters is the appearance of being enviro-friendly, not the reality. It is all the fault of the FIA, apparently; in June they launched a campaign called Make Cars Green, a catchy title if ever there were one. And the idea is that F1 will lecture the rest of the world on motoring with as little impact on the environment as possible. This, from the governing body that has frozen their gas-guzzling engines for five years, thereby preventing the introduction of alternative fuels long enough for the sport to be even further behind road cars than it already is. It is appearance that matters. At least Honda's vile color scheme can be vaguely justified by the fact that the parent company sell the occasional hybrid; F1 does nothing comparable, the much-vaunted KERS being intended as a way to give extra power rather than lessen the need for fuel to be burned. If the governing body were seriously interested in environmental measures, it would be looking at the use of alternative fuels, rather than seeking ways to make the internal combustion engine last a little longer. Who does the FIA think it is fooling anyway? The public has been battered by propaganda regarding the use of fossil fuels for decades and the car companies have been working on solutions for just as long - since when does anyone need F1 to masquerade as the trend setter in this particular arena? All this hype merely serves to bring the energy wastage of the sport under closer scrutiny, encouraging the public to see it as a main offender against the environment. And what does the FIA's campaign offer in the great environmental war? Well, guess what, dear motorist, it seems that it was your fault all along and the FIA has a list of ten pointers to help you mend your ways. No matter that they are the same old hackneyed points made for years and obvious to anyone who wants to save on a bit of gas - this is the FIA talking and so these must be the very latest thing. It is the first point that gives the lie to all this posturing: Buy Green. That means that it must already be possible to buy cars that are greener than most (and we all know about the various manufacturers' offerings); so how can F1 claim to be leading road technology in all this? If we were to follow the sport's example, we would be demanding big V8 engines that consume gasoline as though there were no tomorrow. I could go on and on about the hypocrisy at the heart of the campaign but my readers know my views on the matter only too well. Let me just mention the awful color clashes we will see in Fuji when the tires are fitted. And that will be appropriate too, given the way F1 seems determined to turn itself into a traveling circus. Welcome to F1, the sport that makes you laugh one minute and cry the next. I´m sure this guy is a F1insight´s reader. What is fantastic is that your post, THE IMPORTANCE OF F1 BLOGGING, last week is a great piece of resistence and a great insight into the real position of the bloggers today in F1. I must to congratulate you, Keith and others for your fantastic job made in favor of us, fans. OH, THANK YOU! i needed a post town hall laugh. but, really, how nice to see a bare naked front wheel hub. Clive you must think "This stuff writes itself" Environmental friendly Cars, now thats an oxymoron ;) .Iam not a great believe in the global warming, sorry its called Climate change now as its stopped getting warmer debate. And who will listen to the FIA after looking at its decidedly iffy past, the first thing that springs to my mind is `wheres the catch`,as we know that they do things only to line there bursting pockets, a point on what Becken said, I have nothing against Ferrari, it`s as you have said `The fact that they are going along with what the FIA are up to` and not saying `hey we want to win this fair and square thank you very much` is what gets my blood boiling. And I like to think that we would stick up for any team driver or circuit getting a bad deal from the FIA, whether the car is red or silver, or the driver is black, white or green with spots on is irrelevent. And Ferrari getting a bad decision from the FIA, wow look, theres a flying pig. town hall, TOWN HALL, dont say that word, I think my heads gonna expl BANG! 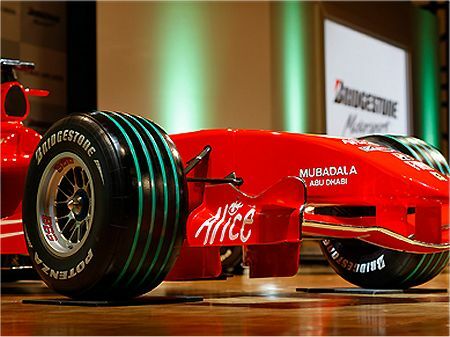 With all the stuff going on in F1 this year, it's rather depressing to see something like the green tire. It's dumb, stupid, and obviously a press event designed to move the focus off the real problems in F1...mainly Max & Bernie. Do they think we're so easily distracted? just out of curiousity-any theory about why only one of the tires has all four grooves green? did they run out of toxic green magic markers? "delighted, pleased, happy"... sometimes it really does bite to be in f1, doesn't it? you have to actually pretend you believe this is important and that you are as completely out of touch as the lunatics running the asylum. Gusto: You have stated it exactly - all we really want is fairness, regardless what teams are involved. And obviously Max does not know what on earth we are talking about because his world is all about "might is right". Vera: The system of one white groove to denote the softer tire continues - so the option will have three green and one white groove. It's going to be a kaleidoscope of color out there! It really is beyond belief that anyone in Bridgestone thought to highlight environmental issues and to do it in such a ridiculous way. If Max wants us all to be green why did he select a tyre supplier who makes all their tyres in Japan. Then ships them to England. Then ships them all round Europe etc. SUrely if he was being green he would have insisted on tyres being made in Europe where most of the races are. Could be the FiA are jumping on the Environmental Band Wagon/ Climate change gravy train, knowing that Goverments are now giving dispensations and grants (thats when Bernies eyes went Ker-Ching and dollar signs appeared) to companies and organisations. You can picture the negotiations,` 0.05% over ten years of a digustingly large figure, and all we do is help pump out your propaganda, Mmmmm, were start by colouring in the grooves with a green felt tip pen, where do I sign. Hi. Sorrow was like the wind. It came in gusts. I am from Qatar and also am speaking English, give true I wrote the following sentence: "A sample group health quote request." With respect :-D, buy insurance lead. I am from Central and too bad know English, tell me right I wrote the following sentence: "Gel nails better, items on the experiments and has often a certain field of mesh which she believes to keep." With respect :P, Uv gel nails supplies.